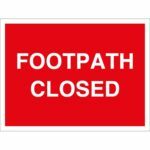 Temporary closure of Offa's Dyke footpath, Wyebank Road, from 29th April 2019 … read more . . .